When looking to buy shipping containers, one of the most important aspects to take into consideration is the location of the container seller. That's because you'll have to transport the containers to your location and you will want them to be as close as possible to you to save on transport costs. Once you have bought the containers you'll need to move them to their new location. 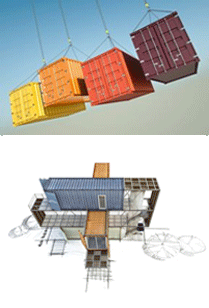 Many of the companies that sell new or used cargo containers offer this service. If they don't you can easily find a transportation company that will deliver the containers to your location. Location: In most cases the delivery of a cargo container is done with a semi tractor-trailer that has the ability to slide off the bed of the trailer. If the location where you want to place the container is at the end of an easily accessible road, you should not have problems. Because the trailer is large, long and heavy, most drivers will not drive off of a road or paved surface. If your location is any distance from a road or driveway, it is best to discuss this first with the company that is delivering your containers. You must take into consideration the amount of moisture in the ground, slope and the driver's experience level. Space: As we said, the tractor-trailer has the ability to slide off the bed of the trailer. Because of this, you need to have more than 80 feet of space in front of the location where the cargo container is to be landed and 40 feet in case the delivering company is using a 2 axle bobtail, for the delivery of a 20' container. Also, in the case of a slide off trailer, make sure you have enough overhead clearance at the location where the truck will deliver the shipping container. Check the overhead wires especially! Click here if you are interested in shipping container tracking and here for information about tracking containers in China.